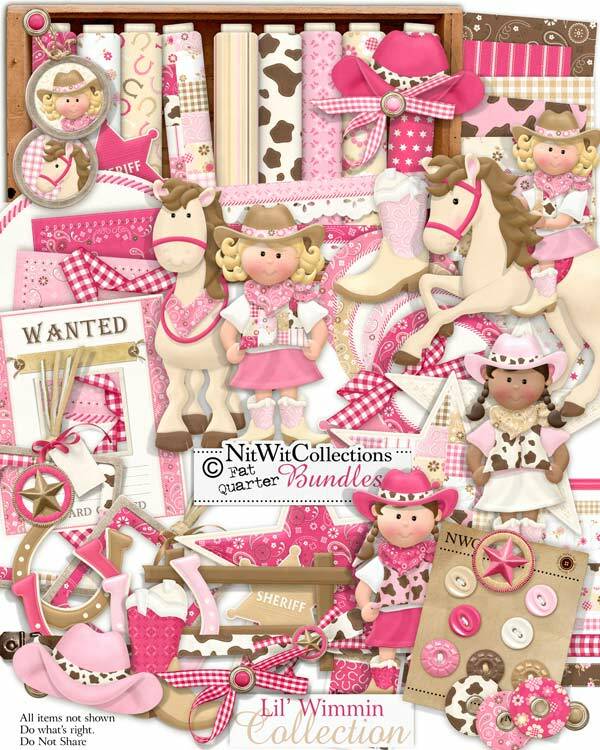 "Lil' Wimmin" Collection is a salute to the cowgirls out there! Ranching is tough work and the cowgirls are an equal partner in this noblest of professions! Now even if you are just "country at heart" this Collection contains all of the elements to kick your boots up and show off your country pride! If you are looking for a complimentary Collection for your cowboy, just mosey on over to our FQB - Lil' Tumbleweeds Collection! 3 Borders with lace - we are still women and enjoy the finer things! 2 Star Charms - maybe on Old West Badge?? 1 Gingham bow - who doesn't love gingham? 1 Gingham scrunch - it was folded in my "cowboy's" pocket, what can I say? 3 Horseshoes - triple the good luck! 3 Sheriff Badges - I now Deputize you!! 3 Stars - we know you're a star, now show everyone else!! 1 Wanted Poster - complete with a window to put in your favorite "fugitive"! !